Centuries in the future, a deep-sea expedition comes across a sunken ship in the depths of the ocean. After acquiring sufficient funding, they send out a dive team to inspect the wreck, and they uncover a waterlogged journal locked within a chest containing nothing but a strange musical instrument and an empty tankard. The following paragraph is a historian's professional interpretation of the recoverable segments of the document, followed by the transcript itself. It seems as if this is a captain's log belonging to one of the pirates that sailed these waters, known then as the Sea of Thieves, roughly 300 years ago. It's remarkable that a document such as this survived so long completely submerged. It seems to recount this particular pirate's journey from the outset—strangely not knowing how she arrived in this place, but taking it in stride nonetheless. Throughout the document, she catalogs the various struggles she faced during her many voyages, and despite a deep love for the sea and its beauty she constantly laments the aggressive behavior of other pirates, and lack of maritime regulations restricting their violence. (This implies some pirates abide by laws, which is an interesting insight.) I have attached the transcript of her log for further reference. Below is a transcribed version of the waterlogged journal. 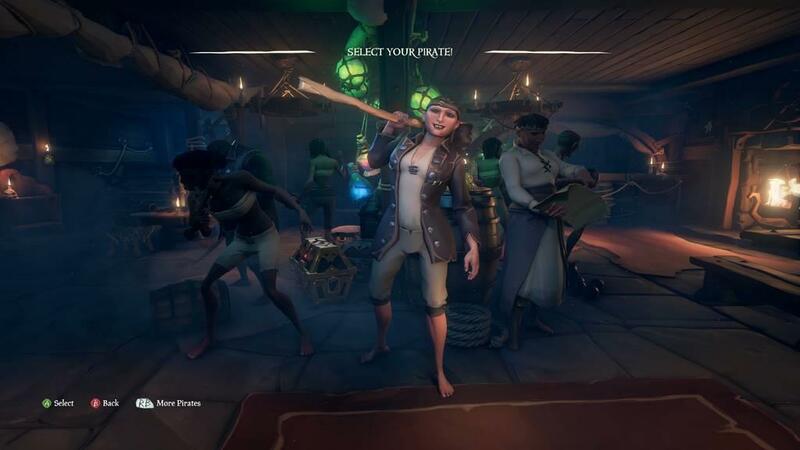 Day 1: I know not how I got here, not much about the "Sea of Thieves" which I suddenly find myself sailin', but I hear she be an unforgivin' mistress like no other. I woke up with a tankard o' grog in one hand and a banana in the other—more than enough company for the high seas, in my opinion. I found a sloop docked down at the shore, and since no one stopped me from takin’ it I guess she be mine now. I named her Sweetheart. I think she'll carry me through the waves just fine. Just a lone captain and her little ship. Took a while to get out to sea by myself—sailing lonesome be an unwise decision, but I was never known for wisdom—but me and old Sweetheart made it. 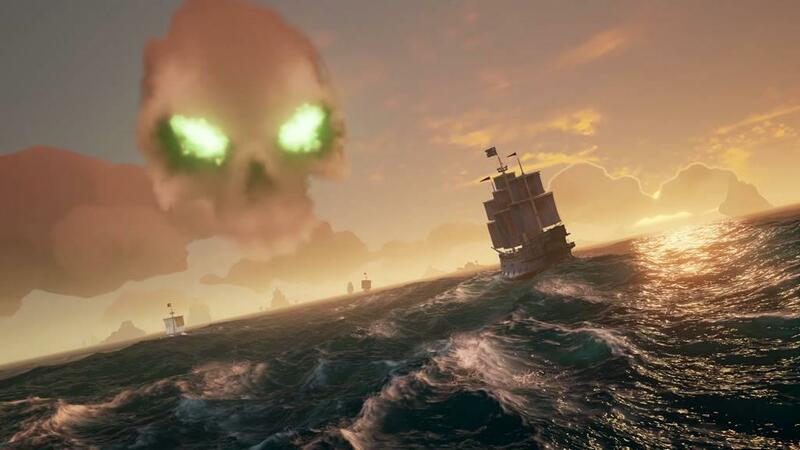 I been sailing for a good three minutes, a good headwind at me back, but already I see a cloud the shape o' a skull on the horizon, eyes aglow with a wicked green light. No one in the tavern warned me about this; no one warned me about most anything, if we be honest here. I dove into this blind as a bat, with only me instincts as a guide, and me instincts are tellin' me to avoid the giant scary skull. Day 2: Realized I left without grabbing a voyage. Quest. Whatever. Returned to the island, grabbed one from the Merchant's Alliance. Need to catch chickens. It seems unbefittin’. In the margins is scrawled a note in slightly darker ink, like it was added later. There is also a frowny face. Day 3: I always thought the sea would be the one to take me, and that would be that, but apparently not. Decided on the best island to catch chickens—or just threw darts at the map, either or—and made me way there. In the dead of night, I crashed headlong into the shore, but patched old Sweetheart up just fine. It's hard without a crew, much as I like being on me lonesome. Might have to search for some worthy men soon. The chickens were wily ones. Skeletons rose from the sand and were felled with me trusty cutlass, but the chickens avoided me at every turn. I musta looked a fool, stumbling around the island with a coop in me hands, but no matter. I managed to get the black one I needed but no white one seemed to live on the island, so I raised anchor to depart, and I thought it would be easy as that. No sooner had I lowered sails did a vessel come up alongside me—a galleon, real pretty thing—and sank poor Sweetheart before I could bail her out. Just outta spite, her crew boarded us at the last second and planted a flintlock to me forehead. Thought that would kill me, but all it did was send me to a strange vessel sailin' through a greenish abyss. Captained by a ghost, it was; never seen Davy Jones, but I reckon that's what he'd look like. Didn't have much time to contemplate before a door opened up, and I went through only to find myself back on an island, with a mermaid wavin' at me from the waves. Did what anyone would do and swam out to her, and suddenly I found myself on the shore again, a familiar-lookin' sloop waitin' for me. I boarded Sweetheart II, but so did the scallywags who'd sunk me before, and sunk me again. Back on the island, I stumbled about until a series of snakes sent me to death's door, but by the grace o' the sea I made it. 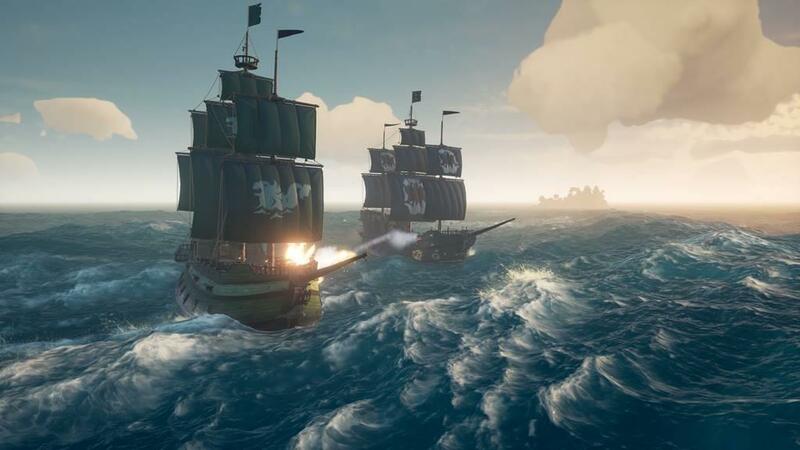 I could see the others in the distance leapin' into the waves and swimmin' to the island, no doubt in search of me blood, but they left their sloop unguarded. I had nothin' to lose—my ships were gone, as was me beloved chicken—so I snuck aboard and sailed away. No sooner did I think I was home free did they materialize on board, and shot me right in the head again. It's been a rough day, but finally I'm on Sweetheart III, somehow with the same journal I had before. Sailin’ alone be nigh impossible in these parts. Day 4: Somehow I found myself with a crew on a galleon—not as a captain, but I s'pose I should be grateful that they didn't cut me down. 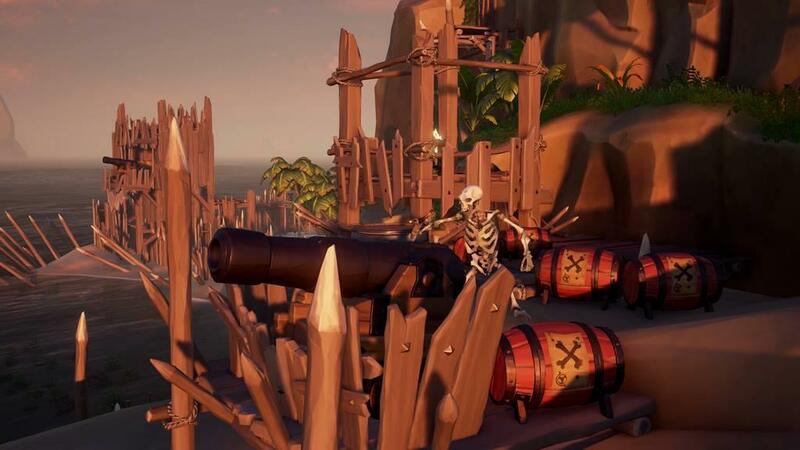 Friendly enough, considerin' that everyone else I've met on the seas has sent me straight to Davy Jones' locker, or at least that strange ghost ship that seems to be the same thing. Though each of us already had our own sailin' experience, we seemed to start right from square one for some reason, with little gold to our name. Made little sense. Again, I found myself in the position of needin' to chase down some chickens, which was an adventure by itself. It took us the entire day to get the coops and cast off. Infuriating. The handwriting on Day 5, though undamaged by water, is horribly sloppy and stained with what looks like grog. Not much can be deciphered, aside from the fact that the sailors found a barrel of alcohol below deck and consumed most of it. According to a readable chunk of text, there was vomit all over the decks, and music sounded absolutely terrible when they were drunk. This is perhaps a reference to the hurdy-gurdy that was commonly found in a sailor’s inventory. Day 6: We encountered another galleon today, 'bout as magnificent as ours (which I secretly named Sweetheart IV). The other mates didn't know what to do; one wanted to attack, but the others managed to keep him down. Kept rantin' on and on about an "international incident" or some such. Me, I was too focused on the chickens, or the fact that for some reason it was ridiculously hard to obtain said chickens. Apparently chicken coops are rarer than gold in these parts. We also locked one of them, Sailor Randy, in the brig, for crimes too horrific for even me seasoned self. Debated sinking the galleon while he was on the lowest deck. It is unclear from the given text what the result of this debate was. We must further investigate this "Sailor Randy." Several entries are too damaged to discern. The next readable one is Day 11. Day 11: Chickens. Why is it so hard to wrangle some chickens? Every time I grab a mission and get our coops, I somehow manage to lose them—whether I get sunk, or just botch the chicken catch. And apparently it’s the worst crime on the seven seas to give me more chicken coops. Times like this, I remember how much I woulda loved some more guidance at the outset. 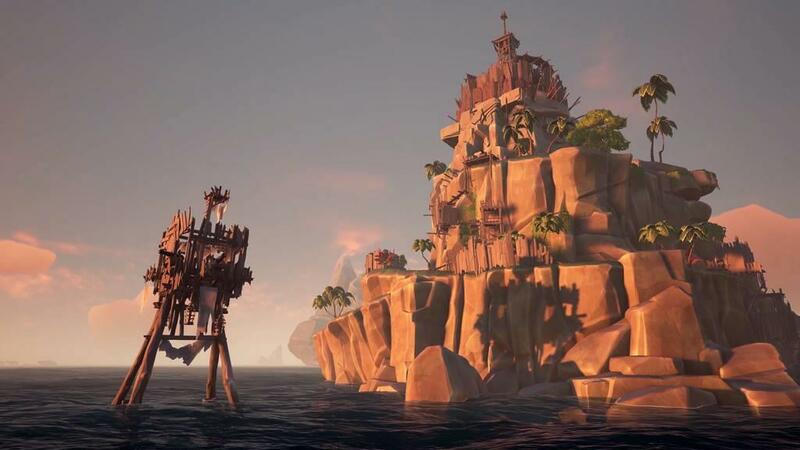 We had to scuttle our lovely galleon once or twice (which, funny enough, doesn’t destroy it, but just relocates it, which is helpful if there are some spawn-camping bilge-rats on the horizon). Doesn’t get us our chickens, though. We closed the night with a sorrowful sea shanty and the hopes of a better day tomorrow. Below are several crude doodles of chickens in cages. Also grog stains. We presume that the crew succeeded, though there are no more entries for a while. Day 16: Today be a treasure huntin’ day! We cozied right up to the Gold Hoarders, and it’s much more me cup o’ tea. 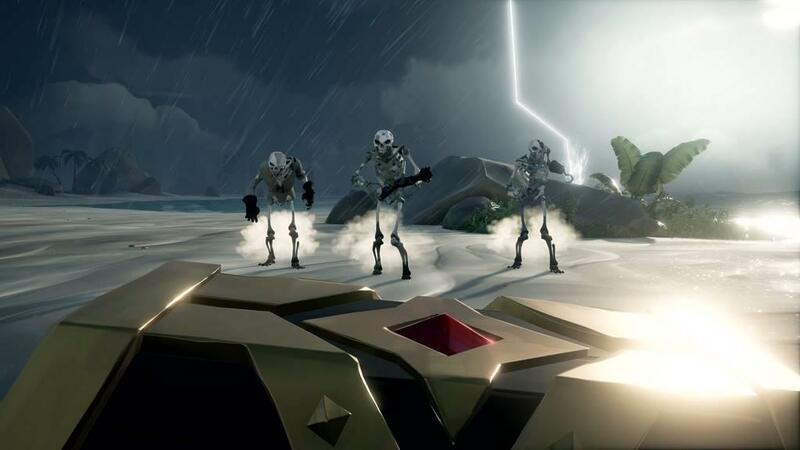 They be simple missions to start out, just like they be for all factions—just goin’ to an island, diggin’ up a chest, and bringin’ it back—but it gets better as it goes. Regret spendin’ so much time chicken hunting. Day 18: I find myself on me lonesome again, sailing through the sea with no crew—just me and Sweetheart IX—and day by day I miss me old crewmates. 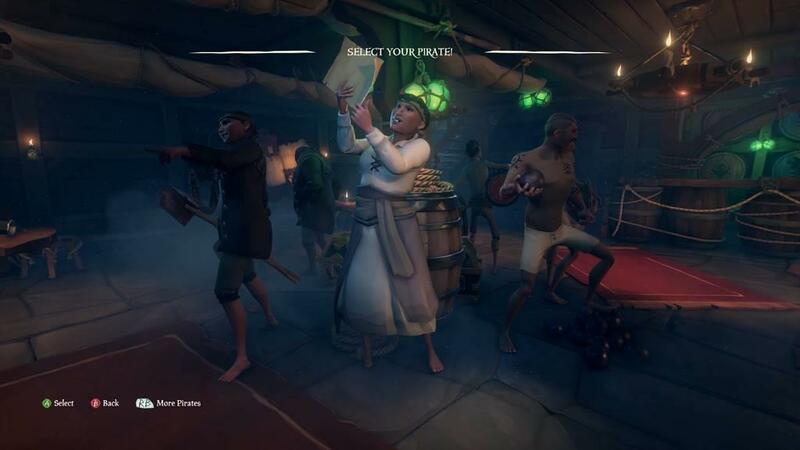 Nobody attacked us when we were a crew o’ four, on our beauteous galleon, but now that I’m alone on a little sloop I’m the primest of pickin’s, even when I’ve got no loot to me name. Far as I can tell, there’s nothing I can do to ease the suffering of dying over and over again; as ye olde message boards say, perhaps “passive mode” would be a suitable fix. It’s really obstructin’ me sailing. Day 19: I’M DONE. I’M DONE. FAR AS I’M CONCERNED, THE SEA CAN HAVE ITS TREASURE. What follows can only be described as furious scribbles of swear words, and a few drops of what is likely blood. When the text resumes, the pirate seems to have calmed down. I saw it. The fabled kraken of the deep. I saw it, and it killed me. 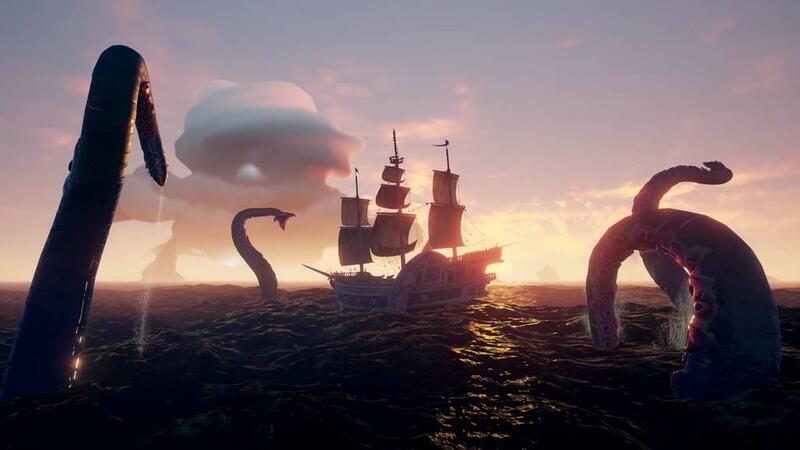 I was just sailin’ through the sea on Sweetheart XIII, mindin’ me own business, when suddenly the waters turned a pitchy black and clouds swept over the sky. Then up! UP! sprouted tentacles on all sides, more fearsome than the stories ever let on—a mouth on the end of each, filled with deadly teeth. 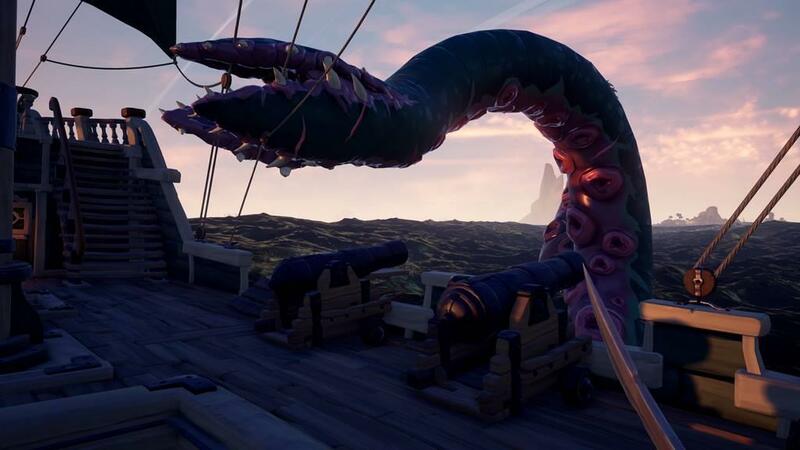 For ages I fought, sucked into its mouths time and time again and just barely escaping before it drowned me—my cutlass never saw so much battle—but the monster just wouldn’t die. It slammed its tentacles down on the deck, ripped me away from the ship, over and over again, until finally I returned to the ghostly ship that bore me spirit so many times before. Ye know, the sea is beautiful, and sailing in a crew is a delight, filled with sea shanties and barrels of grog. But alone, it’s a life fraught with peril, and while those who like to wander might be fine with it I need a bit more…guidance in me life, I s’pose. More camaraderie. More reward. I risked me life on those waters day in and day out, but I didn’t get as much as I wanted. In a word? Fine. It be fine. Perhaps it…isn’t a pirate’s life for me. This historian notes the progression in the pirate’s attitude. At the outset, she is optimistic at best and infuriated at worst. Her outlook seems to peak when she first joins a crew and sails with friends, but she cannot maintain that energy, and eventually devolves once again into frustration—primarily, it seems, with other pirates of the time, who show little to no restraint in their violence for no reason. However, she maintains a constant love for the sea, and seemed to greatly enjoy the time she spent in a full crew; even throughout misfortunes, such as lost ships and chicken mishaps, there seemed to be great amusement. 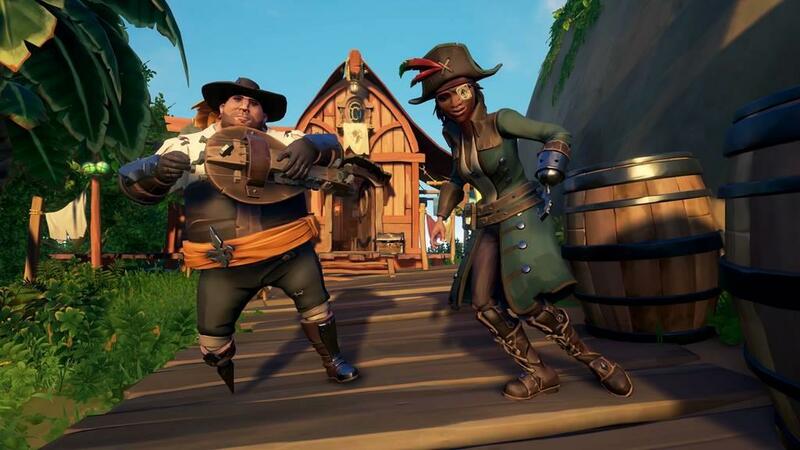 Perhaps, had she a more accessible and constant crew, her piracy might not have ended so soon after her arrival in the Sea of Thieves.